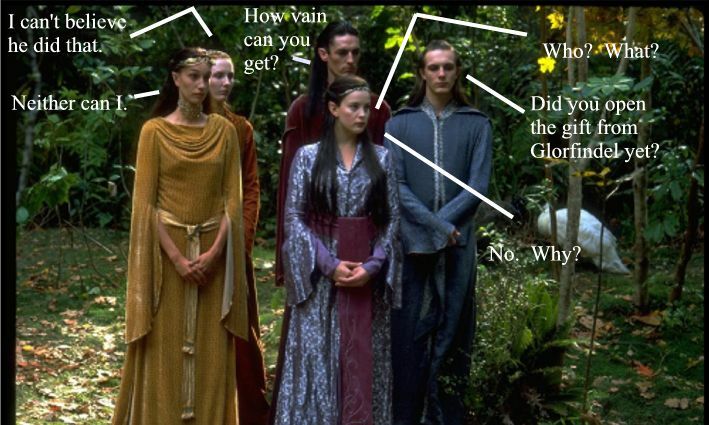 “So what do you do here for fun during the winter?” Arwen was being escorted about Lothlorien by a small company of the Galadhrim who were usually assigned to the royal talan. Among them, Celebdreth, her cousin and son of her Uncle Rumil, and Dinendal, a young ellon who had been taken in by her Uncle Haldir when Dinendal’s parents disowned him. They had made their way from one neighborhood to the next, though for all it was worth, Arwen tended to think that all of the neighborhoods looked basically the same. “We guard the trees,” spoke one of the ones in the back. “He already said that!” answered another. “What about diving? I am not much for swimming, but I like diving,” said another. 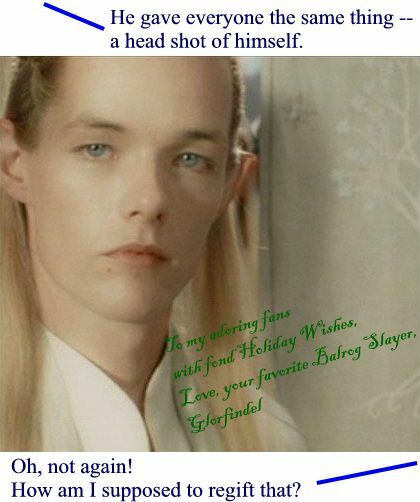 To this, all of them, even Arwen, laughed. “We play music, and we dance sometimes,” offered another. “Oh? Do tell,” said Arwen cheerfully, stopping in a clearing. “And... will you have blindfolds, too?” asked Arwen, again lifting the blindfold to reveal an innocent, doe eyed look. For a moment, it looked as if Arwen was going to remove the blindfold and beat Fereveldir with it. Instead she nodded slowly. “Wonderful. Ready?” Fereveldir pulled the blindfold snuggly over Arwen’s eyes again, only to leap away a moment later as something else caught his eye.